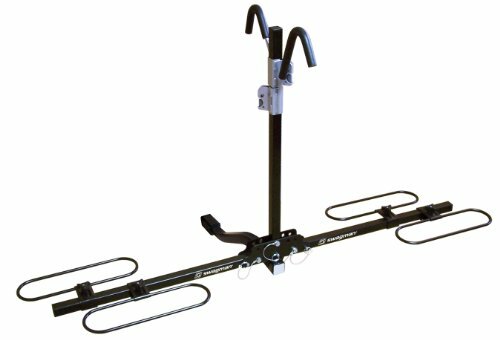 Using a hitch mount bike rack is a great way to securely and safely transport your bicycles. This kind of bike rack works with a wide array of vehicles. Whether you have an SUV or a minivan, as long as your car has a hitch receiver installed, you can use a hitch bike rack. With a bike rack, you’ll have more fun biking days with your family simply because it’s so easy carrying the bicycles with you anywhere. 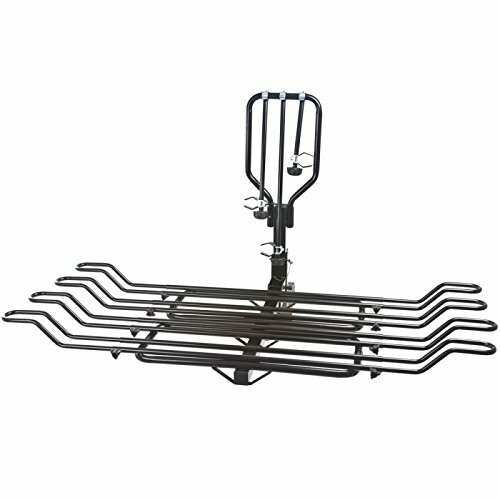 Whether you want to go biking on the camping site, the beach, or a park, you can be sure the rack is always ready to carry and support your bikes. You don’t need to burn a hole in your pocket to get a good bike rack. Have a look around and you’ll find the ones that offer easy assembly, easy loading, stable bike mounting, and adjustable design that can accommodate various bike sizes and styles. If you’re ready to get a bike rack for your car then have a look at these twelve best-rated racks that so many people use and love. They have received numerous excellent reviews and ratings due to their functional features and of course affordable prices. The Yakima RidgeBack is a heavy-duty rack that’s made of steel. It’s durable, well-built, and can fit four bikes with different frame styles easily. ZipStrips makes sure the bikes are secure throughout the whole trip. This bike rack fits 2-inches and 1.25-inches receivers. A 2-inches hitch adapter is already installed, so if you have a 1.25-inches receiver, you just remove it before installation. The rack itself is already assembled. 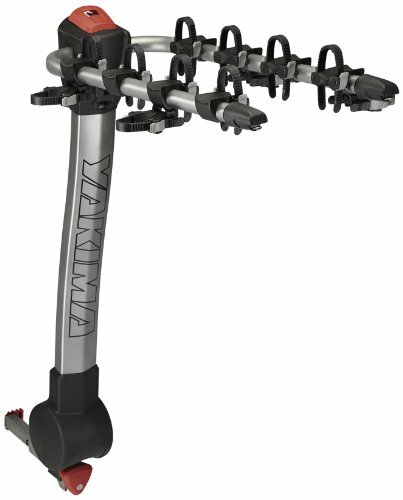 Yakima’s genius design allows you to fasten the rack into the receiver by simply tightening the red knob on the front of the rack tongue. No more wobbling or swaying. The RidgeBack has a tilting mechanism, so your trunk is still accessible even when the rack already has four bikes on it. The arms are foldable to reduce its footprint when not in use. The levers that you need for tilting and folding it are located on top. They’re easy to reach without any need to bend down. Installation is super easy. It takes at most 10 minutes. It uses a hitch bolt instead of a pin, so you need to screw them in and out to install and uninstall. The good thing about this is that you get no wobbling either on the loaded rack or the hitch mount. Mounting and unmounting the bicycles are equally simple. The Allen Sports Deluxe fits three adults bikes with ease. Cruiser bikes, mountain bikes, and whatever else you have at home are kept nice and stable. Some shuffling may be required, but once you get the hang of it, it’s won’t even be an issue. It pivots down to tilt the main mast away, so you can still access the back hatch with or without the bikes mounted. The steel construction feels solid, and you’ll feel confident leaving your bikes on the rack even when you need to go through bumpy routes. When you only need to transport one or two bicycles, the Swagman Cross Country is an excellent choice. It’s a capable carrier that’s lightweight yet sturdy. You may feel somewhat uneasy about how skinny this thing look, but it is more than up for the job. The maximum weight capacity for each bike slot is 35 pounds. That’s good enough for most bikes on the market today. The combination of tire slots, straps, and frame hooks keeps your bikes snugly in their places. They won’t fall off when you’re speeding down the freeways or going off roads. No matter how bouncy the road you take is, those bicycles will stay put. Assembly takes mere minutes. With threaded hitch pin, the rack has very little movement. The center tube folds down to allow access to the trunk, and all the tire slots also fold up for easy storage. This rack comes pre-assembled. Installation is straightforward and, thanks to the lightweight construction, a one-person job. You don’t need extra hands to help you lift the rack during installation. The tightening hitch bolt and the thumb screw ensure the rack work flawlessly without rattling. This car bike rack provides plenty of clearance to the trunk, and you can get more by tilting the rack. Both arms can be folded down when not in use. Thick paint and powder coating protect the hitch and the rack from corrosion and the elements. This contraption is usable in dry or humid conditions. Anti-sway rubber mounts hold the bikes in place. As the name suggests, they prevent the bikes from swaying too much during transport by gripping the bikes’ frames tightly. They work well for road bikes with straight top frames. For women’s bike or BMX, you may need to use an adapter bar. Need something tough and durable to take your motorbike or scooter to the mountains? Look no further. The Best Choice hitch mount carrier is the one you need. Its heavy-duty steel construction, 500-pounds of maximum weight capacity, and thick paint coating is more than sufficient to take your offroad dirt bike anywhere. Assembly is as easy as tightening eight nuts and bolts. Installation is quick and easy as well. Using the hitch tensioner, you can ensure the rack won’t rattle or sway when you’re cruising on highways or trails. 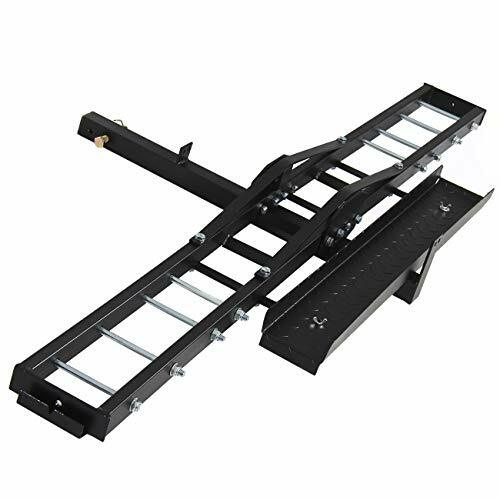 Loading your ramp to the carrier is made easy using the included loading ramp. It’s a bit short but still functional. You can load from the left or right. The ramp is secured to the carrier when not in used using a pair of butterfly screws. The bolts on the frame are easily adjustable to match the length of your bike. 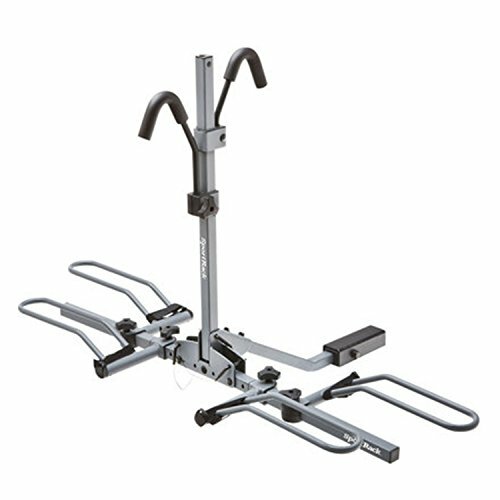 Four tie down points on the rack allow you to secure the bike further. At 86 pounds, you can be sure the Curt 18086’s steel construction is no joke. It’s easy to put together and install. That weight, however, means extra helping hands are required. The Curt 18086 has 180-pounds weight capacity and fits four bikes snugly. If you only need to carry two, you can easily detach the two rear trays for a more compact setup. The tire-trays and adjustable arms keep the bikes in place. They won’t bang into each other during the drive. The arms are adjustable and easy to use. They can accommodate various sizes, frames, and styles. A 26-inch road bike fits as easily as a small kid BMX. With elevated tire platforms, the bottom won’t scratch on speed bumps or steep inclines. When not in use, you can fold up the trays. This feature makes it easy to store the rack in the garage when you don’t need it for a while. 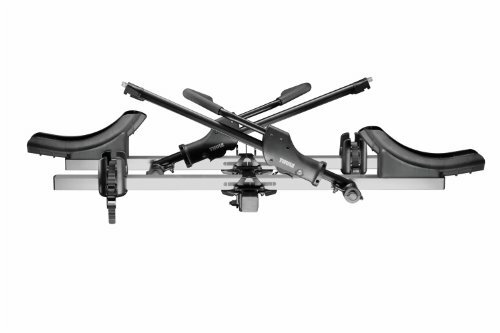 This is another classy and ergonomic bike carrier from Thule. It’s a 2-bike carrier with serious features for all types of riders. This bike carrier is easy to install. The tools required are already included, though you’ll be better off using your own set of hex wrenches instead. You also need quite a while since there are many nuts and bolts to fix. Overall, the assembly may take about 40-45 minutes to complete. With adjustable wheel tray and straps, this Thule hitch mounted bike rack fits bikes with 20-inches and up to 29-inches wheels. Stabilizing arms grab the bike’s wheels to improve stability. This combination holds the bikes steadily and enables the rack to fit various frame designs and geometry. Three locks are included to secure the rack and two bikes from theft. The two cable locks are integrated to each stabilizing arms and secure the bikes without scuffing the frame paint. The Highland Sportwing is designed for riders who want a quick and simple solution for their bike transportation needs. 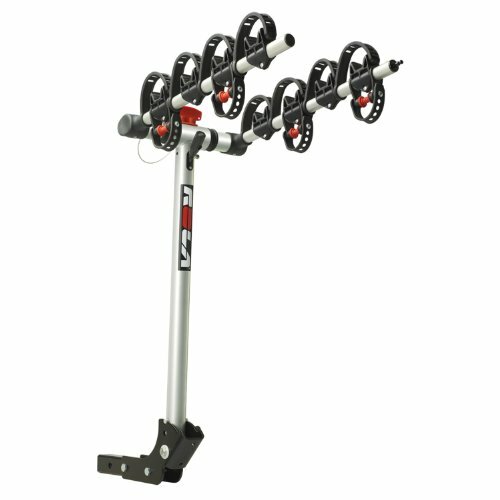 Easy to assemble, easy to install, easy to mount and unmount the bikes. Assembly and disassembly literally take less than ten minutes. When you arrive at your destination and want to put the whole rack in the trunk to avoid theft, you can do so without wasting your precious time. Mounting and unmounting the bikes are just as simple. You set the top of the bikes’ tires on the cushioned brackets, fasten the rubber straps, and use the strong Velcro to hold the bike firmly. With this rack, adult and kids bikes are solidly kept in place with no need for adapters. This bike carrier is capable of transporting four bikes at once, but if you only need to carry two, you can take the three additional pieces off and store them away. The Pro-Series Eclipse is a heavy-duty and well-made bike carrier that can transport three adult bikes together. Easy assembly and installation despite its 33-pounds wight. This hitch bike rack sits close to the bumper, about two inches, which contributes to its stability. It doesn’t sway a lot when you make a turn. Due to that short distance, this rack won’t do if you have a spare tire on the back. On the rack, the bikes are held in place with Velcro. No guess works here, since everybody and their moms already knew how to use it. Built-in slots on the rack allow you to add locks to secure the bikes. The Pro-Series Eclipse is one of the few bike carriers that has a rear reflector. It’s a simple accessory, but when you drive in less-than-ideal weather, it can help greatly. It improves visibility to the carrier, so you are less likely getting rear-ended. 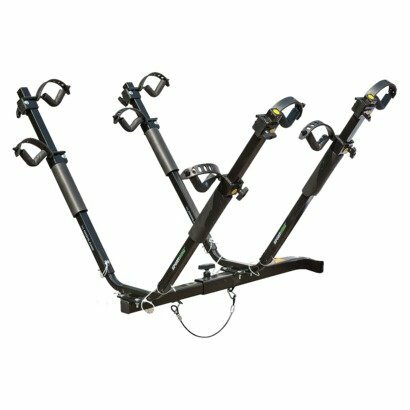 The Rage Powersports bicycle carrier can fit two or four bikes at once. The box that the carrier comes in has two smaller boxes inside. One is for the hitch attachment along with the first two racks. The second box is for the extension where you can fit two more bikes. This carrier is a heavy piece of contraption. The weight is a good indicator of how sturdy this thing is. It’s rated at 180 pounds, so four bikes won’t be a problem there. The powder coating is also top notch. It will protect the rack against corrosion for some years. The rack is adjustable to fit adult and kids bikes. It can be folded up when not in use. It also tilts down to allow access to the trunk. Since the rack uses a pin instead of bolt to connect it to the receiver, there’s a little play there. You may want to get an anti-rattle kit when you load it up with four bikes to reduce the rattle. 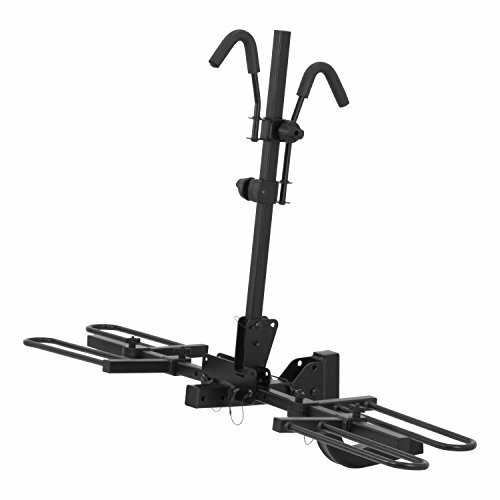 This is a simple 4-bike carrier from Rola. It’s a hanging style that works mainly for straight frame style like the ones you find on road bikes. For another types of frames and smaller bicycles for children, you may need cross-bar adapters. It will be tricky to fit such bikes without adapters. Rola carrier’s tough construction doesn’t add much to the weight. At 32 pounds, this is still a lightweight and portable bike carrier that’s easy to install on your own. The installation uses hitch bolt instead of a pin, so the rack doesn’t wiggle. The tilt-down feature makes it an excellent bike rack for SUV. You can open and close the trunk even when the rack is fully loaded. To prevent the bikes from swinging, this bicycle carrier uses stabilizer straps. Built-in steel cable and locks keep the bike secure from theft. For the amount of features, the price is very affordable. The Sportrack SR2901 is a simple tray-style bike carrier that can hold two bikes for transport. It fits 1.25 and 2-inches receivers, but the included adapter isn’t the best. Still, if your route is composed of mostly highways, the rack won’t wobble too much. It’s an affordable solution when you need to take two bikes to the park or camping site that’s not too remote in the mountains. The SR2901 doesn’t have a tilting mechanism, but you can fold the vertical frame to allows access to the trunk when the rack is not loaded. Loading and unloading the bicycles are easy because the trays don’t sit too up high from the ground. With rubberized hooks, the rack can hold down bicycles with various frame styles without scratching the bikes’ paint. The hooks keeping the frame steady while the wheel trays and velcro straps on the wheels stopping the bikes from moving about during transport. Tilting mechanism: With a tilting mechanism, you’ll have plenty of clearance between the rack and the car’s trunk. You can easily take out your bag, camping gears, or picnic basket out from the trunk. Obviously, tilting the rack will be harder to do when it’s loaded. One person must hold the weight of the rack while the other is pulling the pin or lever that holds the frame. Foldability: Being able to fold up the rack when not in use is a huge convenience. When you get to the camping site and finish unloading the bikes, you can fold it up before you park the car. It will cut some precious parking space for sure. Easy assembly and disassembly: A quick and easy assembly is a desirable trait for a bicycle carrier because you’re not going to do it just once. For example, you put the carrier together at home and disassemble it on the camping site so that you can put the parts safely in the trunk. When it’s time to go home, you start putting them back together, then pull them apart once you get back. These things happen more than you may think. Easy installation and uninstallation: It’s the same story here. Anything that can be attached and detached in five or ten minutes is a wonderful thing in anyone’s book. Easy loading and unloading: Eventually, you have to get some bikes on and off the rack, right? When you can load one bike in less than two minutes, you’ll have more time to spend riding instead of tinkering with the straps, hooks, and locks. Sturdy construction: Everybody loves a car bike rack that’s sturdy, dependable, and doesn’t make them continuously checking the rearview mirror. When you need to go through some bumpy roads, you’d want that carrier to hold up to the task. Minor wobbling is acceptable, but frame breaking and totaling the bikes is not acceptable. Some racks are made to fit either 2-inches or 1.25-inches receivers while others fit both using built-in adapters. Double check the compatibility with the receivers you have installed. Keep in mind that a bike carrier that holds three bikes or more should be attached to a 2-inches receiver. A 1.25-inches receiver is simply not going to hold it. Some racks work well for road bikes with horizontal top frames but work terribly for mountain bikes. You will need to use an adapter to hold the bikes in place. Racks with tire support and straps work well with a variety of bike frames and sizes. With a tray-style bike carrier, the bike wheels are placed on the tray, and the frame is held in place with an adjustable hook. For a hanging style, you place the frame or top of the wheels on a cradle, the secure it with straps. Generally, bikes sway more when they are hung compared to when the wheels are put on a platform. If you choose a hanging-style carrier, pay more attention on how you secure the bikes to reduce the swaying. Say, you’re parking your car at the park. You remove the bikes, take a ride with your family, then come back with the rack missing. That could happen, you know. With a locking hitch pin, you can prevent people from dismounting the rack from your car. It’s convenient and gives you a peace of mind wherever you go. Steep driveway and high bumps are natural nemesis of hitch-mounted carriers. If you have a sedan or a car with low ground clearance, a raised hitch adapter can add a couple inches to set the frame farther away from the roads. When your bike carrier doesn’t have lockable cradle or hook, use security cables to protect your bikes from theft. Steel cables with locks come in various lengths. Loop it on the frame or the wheels to deter thief from messing around with your bikes. You can also use a steel chain with padlock as an alternative. Some racks use cradle to hold the bike’s frame. They don’t work well with cruising bikes or BMX with sloping top frame. 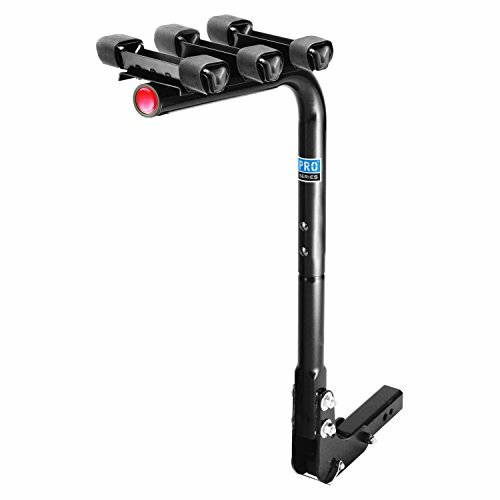 Using a crossbar adapter allows you to use the rack with more varied bike frames and giving the necessary support and grip to hold the bike in place while you’re on the road. Yes, it’s not a typo. Cut a pool noodle into small pieces, then split the pieces lengthwise. Use it on bike parts that are too close together when placed on the rack to prevent them from bumping or rubbing with one another. Bike racks rarely come with reflective markings of any kind. An easy fix is to plaster reflective tape to improve visibility at night. Here are some tips that can make life easier once you bought the rack you’ve been dreaming of. Practice loading the bikes on the rack before mounting. It will save you a lot of energy compared to lifting the bikes up high to the mounted rack. Strap the bikes’ tires together to reduce swaying and secure the bikes better. Use tie downs as a backup safety measure. If the bike carrier fails while you’re cruising down the freeway, the bikes won’t fly off and cause accidents. Put the heaviest bike closest to the hitch to reduce the leverage effect. This will help greatly when you have a rack with tilting mechanism and need to access the trunk with the carrier fully loaded. Added weight to the back of your car may require you to adjust your driving style. When possible, do a test drive with a fully loaded carrier around the neighborhood before you go for the actual trip. This will let you notice any slight changes that occur when you turn around the corners and such. Doing a test drive is especially important if you have a small car. Need to go through a car wash? It’s better to uninstall the carrier first to avoid any unwanted scratches or damage to your car or the carrier. Alternate the directions the bike faces to maximize the limited space on the carrier. The main reason why many people complain that they bought a four-bike carrier but unable to load four bikes is because they miss this simple trick. YouTube is your friend. Most, if not all, manufacturers skimp on the assembly and installation instructions. Yes, they include pictures and sometimes step-by-step diagrams, but they are less than adequate. If you stumble in putting the carrier together, just hit YouTube and search for the brand and model of the bike rack. It will pop some helpful videos that can make things easier for you. Installing a bike carrier on the back of a towed vehicle or a trailer is highly not recommended. It’s dangerous and may pose serious safety concerns when you’re speeding down the highway. On your quest to find the perfect car bike rack, you’ll discover that there are also plenty of trunk mount bike carriers available. 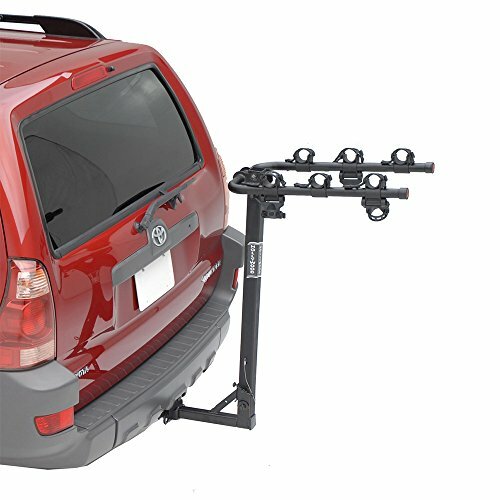 How do those fare against hitch mount bike carriers? Let’s see the pros and cons of each type. Less chance for the bikes to scratch the car paint. Simple, one point installation. You only need to attach it to the receiver. With a trunk mount, you have at least four hooking points. Far more sturdy and stable than trunk mount carrier could ever be. With tilt mechanism, you can still access the trunk even when the rack is loaded. Easy to load and unload bikes. For cars with low ground clearance, the rack may scratch or bump the road when going through steep incline or large speed bumps. Your car must have a receiver installed. Great for cars without hitch receivers. Cost effective. Generally, it is more affordable compared to hitch mount carriers with the same capacity. 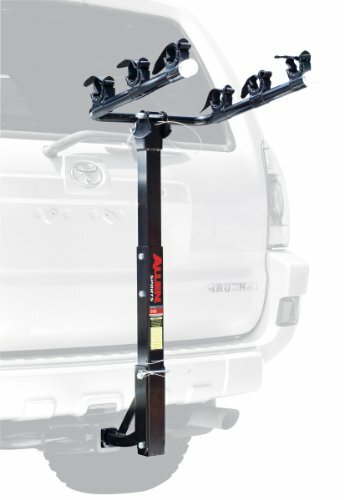 All in all, a hitch mount bike carrier is far better than a trunk mount. If you’ve been looking into a trunk mount bike carriers, now you know there’s a better alternative. Your precious bikes will do better with a hitch-mounted rack in the near and distant future. Okay folks, that’s it for our concise reviews of the 12 best-rated hitch mount bike racks. Remember to get the one that fits your specific needs and wants. For example, if you need to alternate between carrying two and four bikes at once, then the Kurt 18086 is an excellent choice. As for choosing between hanging style or tray style, just ask yourself if you will ever need to carry other than adult road bikes. If the answer is yes, then a tray style will suit you better.